In my previos post I described how to run libvirt/libxl on the FreeBSD Xen dom0 host. Today we're going a little further and run OpenStack on top of that. 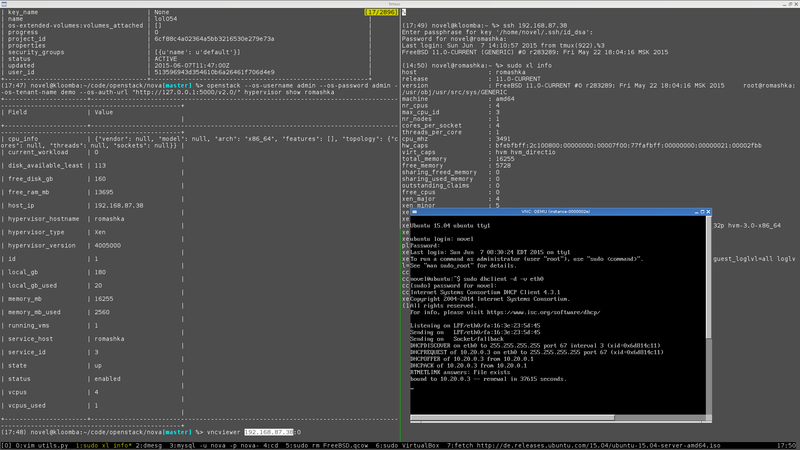 Screenshot showing the Ubuntu guest running on OpenStack on the FreeBSD host. I'm running a slightly modified OpenStack stable/kilo version. Everything is deployed on two hosts: controller and compute. Everything here is installed through FreeBSD ports (except glance and keystone) and don't require any modifications. glance_api is running as pid 792.
glance_registry is running as pid 796. This hosts is running FreeBSD -CURRENT as well. I also wrote some rc.d scripts for nova services except nova-network and nova-compute because I start it by hand and want to see logs right on the screen. Nova-network is running in the FlatDHCP mode. For Nova I had to implement a FreeBSD version of the linux_net.LinuxNetInterfaceDriver that's responsible for bridge creation and plugging devices into it. It doesn't support vlans at this point though. Additionally, I have implemented NoopFirewallManager to be used instead linux_net.IptablesManager and modified nova to allow to specify firewall driver to use. Few more things I modified is fixing network.l3.NullL3 class mismatching interface and modified virt.libvirt to use the 'phy' driver for disks in libvirt domains XML. And of course I had to disable a few things in nova.conf that obviously not work on FreeBSD. I hope to put everything together and upload the code on github and create some wiki page documenting the deployment. It's definitely worth to note that things are very very far from being stable. There are some traces here and there, VMs sometimes fail to start, xenlight for some reason could start failing at VMs startup etc etc etc. So if you're looking at it as a production tool, you should definitely forget about it, at this point it's just a thing to hack on.